Ya Ali Madad! On the occasion of the 79th birthday of Noor Mowlana Shah Karim Al-Hussaini Hazar Imam (a.s.), we would like to extend Salgirah Mubarak to the global jamat. Let us pray for health and well being of our beloved Noor Mowlana Hazar Imam and all the members of the Noorani Family! Ameen. How to Spread the Benefits of 'Noore Karim plus 21 tasbis'? The PDF version of this candle post can be downloaded from the SalmanSpiritual.Com website. Let us now reflect upon the concept of Panj Tan Pak which is captured on a beautiful card which was prepared by (Late) Alwaez Rai Amiraly Amlani in 2001. On the auspicious birthday of Noor Mowlana Hazar Imam, let us also reflect upon the Institution of Imamat and offer heartfelt gratitude for the guidance and vision of our present and living Holy Imam. 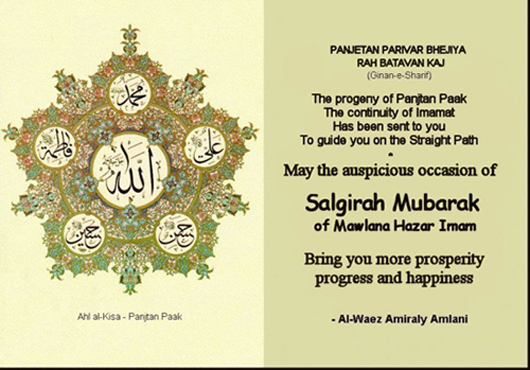 May NOOR Mowlana Hazar Imam and the Noorani family be blessed with excellent health, peace, prosperity and happiness! Ameen. 'Rumi: Thief of Sleep' contains a selection of the best of poetic versions from 'Rendering the Veil: Literal and Poetic Translations of Rumi'. Both books are authored by Shahram Shiva and published by Hohm Press which is committed to publishing books that provide readers with alternatives to the materialistic values of the current culture and promote self-awareness, the recognition of interdependence and compassion. In this candle post, I have selected ten quatrains from 'Rumi: Thief of Sleep' and hope that these will stimulate reflection and accelerate your search for higher spiritual enlightenment. The original reference numbers from two editions of Rumi's 'Divan-e Shams-e Tabrizi' accompany each poem and are followed by AK for Amir Kabir Press and UT for the University of Tehran Press. 1. The repetition of God's name brings light to the full moon. The repetition brings back the lost ones to the path of truth. The saying of "There is no God but Allah." 2. There is a life-force within your soul, seek that life. 3. Love is from the infinite, and will remain until eternity. 4. Behold O tired heart, the relief has come. Sweetly take a breath, for the great one has come. In the form of a human being, to this world He has come. 5. Your love lifts my soul from the body to the sky. 6. Last night in retreat I was talking to the master of knowledge. I said, "Please don't keep the secrets of the world from me." "This is something to be seen, not talked about. Be silent." 7. When your chest is free of your limiting ego. 8. If you are in search of the place of the soul, you are the soul. If you are in search of a morsel of bread, you are the bread. That whatever you seek, you are that. 9. You are wearing a turban and you won't give it to the musicians. Give away that turban and let your pride go with it! Rescue yourself from what you have no control over! Give that turban and in return receive the crown of a king. 10. O you who have died, taking to the grave the desire to undo your knot. You were born in union yet died in separation. You have died of poverty, on top of a treasure. Part 3: How to Spread the Benefits of 'Noore Karim plus 21 tasbi'? Download mp3 audio track titled 'Noore Karim Plus 21 Tasbis' from audio.salmanspiritual.com. Download PDF or click here to see the lyrics and explanation of the dhikr, and how to spread the benefit of this dhikr. 2008 :: What is in the Spiritual Treasury of NOOR Mowlana Hazar Imam? 2009 :: What Gift Should We Submit to our Beloved Mowla? 2012 :: How Should We Actualize Our Bay'ah with the Holy Imam?